Are you looking for a bold way to capture the attention (and emails) of your existing website traffic? In this case study, we’ll discover how KnivesShipFree.com used a giveaway to turn thousands of window shoppers into subscribers, and over $10K in sales. 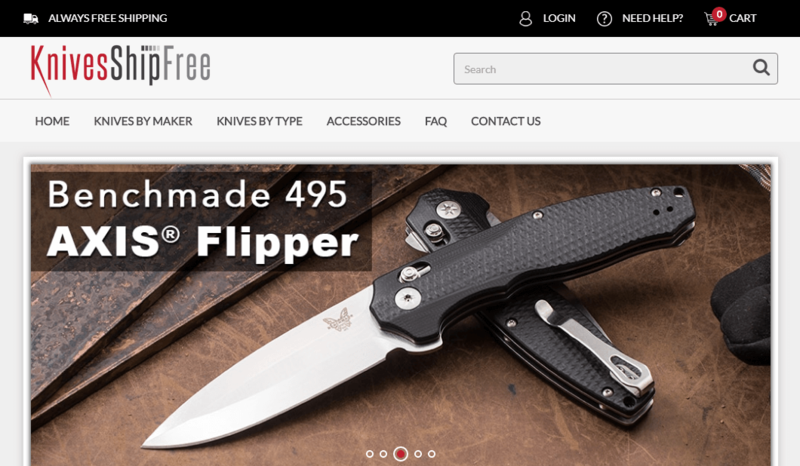 KnivesShipFree.com is an e-commerce store selling premium knives online. The marketing agency DigitalMarketing.org helps them drive traffic and convert sales. Gary Henderson of DigitalMarketing shared with us how they used OptinMonster to generate over $10K in revenue for KnivesShipFree. The primary goal for KnivesShipFree was to capture leads from existing traffic sources. Prior to using OptinMonster, they only collected emails from those who had purchased a product. With millions of organic sessions annually, they wanted to make sure they were also capturing email addresses from visitors who were just browsing, too. 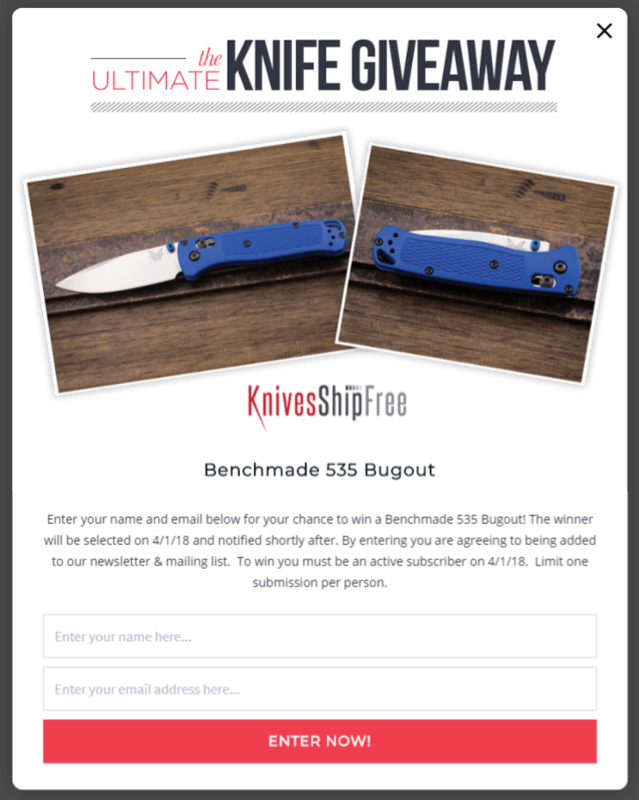 At the beginning of the year, KnivesShipFree decided to create a rolling monthly giveaway prior in advance of a new knife launch scheduled for March. They prepared a series of lightbox optins to collect registrations for the contest. One winner would be chosen every month. After entering the contest, registrants were added to the company’s email newsletter. On the first of every month, a new optin was scheduled to appear. This is easy to do using our scheduling feature. On average, the desktop optin converted 8.64% of visitors, while the mobile version converted 10.31%. In the three months since launching these optins, KnivesShipFree has added over 5,000 brand new emails to their list. Gary from DigitalMarketing.org broke down the impact that increase has had on KnivesShipFree’s bottom line. On March 13, 2018, we had a new knife launch. 31 of those 5,000 people decided to order the knife that day and spent a total of $10,118.20. For 22 of those 31, it was their first order ever. Their orders accounted for $4,373.04 of the $10,118.20. The remarkable stat is NONE of those buyers were added to the list on the day of the new knife launch. They all signed up for one of the monthly giveaways. As a result, they started receiving regular email campaigns and then made a purchase because of it. This is textbook email marketing! The more leads you add to your list, the more sales you’ll make. KnivesShipFree.com used monthly giveaways to entice readers to subcribe to their list. KnivesShipFree.com collected over 5,000 new email addresses in less than four months. KnivesShipFree.com made $10,118.20 on the first day of launching a new product to that list. KnivesShipFree.com earned $4,373.04 in first time sales from the new subscribers. Giveaways are a great way to engage your existing traffic and gain new leads. Use OptinMonster to schedule your giveaway optins, then watch the leads roll in. We found a way to entice a percentage of our browsing visitors to enter a giveaway, which allows us to market to them in a smart way and provide them with the offer they are most likely to be interested in at the right time. Since the beginning of the year, we’ve added 5000 NEW subscribers. Without OptinMonster, that wouldn’t of been possible.